We arrived back from six months in the UK on 1st April. 1,500 mile trip and feeling a little jaded, it was early afternoon and the Honda generator, despite its new spark plug, had to be coaxed a little. It was early afternoon, and the battery box said the batteries had very little charge. We needed to have lights for the evening, fridge on and, of course, broadband. But, even with the Honda coughing and spluttering into some sort of life, it didn’t charge the batteries for our house electricity. Joe made a call to Luis, a friend who seems to know everyone and everything and a few hours later when we had resigned ourselves to an early night, he came roaring up the drive like some caped crusader. He and his friend Salva (a mechanic) took away the Honda and dropped off a dirty, black and evil looking diesel generator that was decibel high and smoke rich. But oh, how we loved it because suddenly we had power! The Honda was cleaned up and serviced; the engine was fine as we knew but Salva had failed to check the power output so it was useless as a generator and he didn’t seem interested in helping us further and no refund was forthcoming. 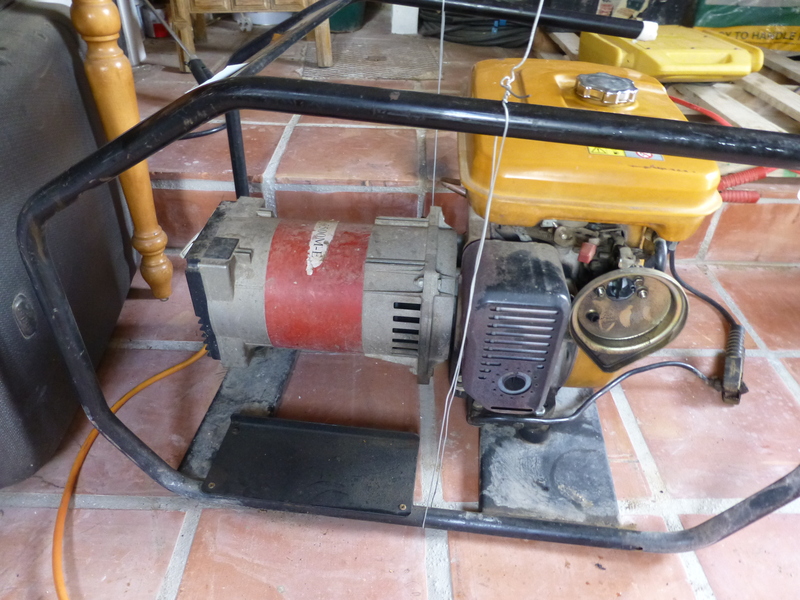 The diesel generator could not multi-task like the late lamented Honda, so in order to have certain things on like the water pump we couldn’t have anything else on in the house except broadband, lights and fridge/freezer. When the sun shines, our four solar panels provide sufficient power to charge the batteries and at the same time, keep the basic electrics of the house functioning. 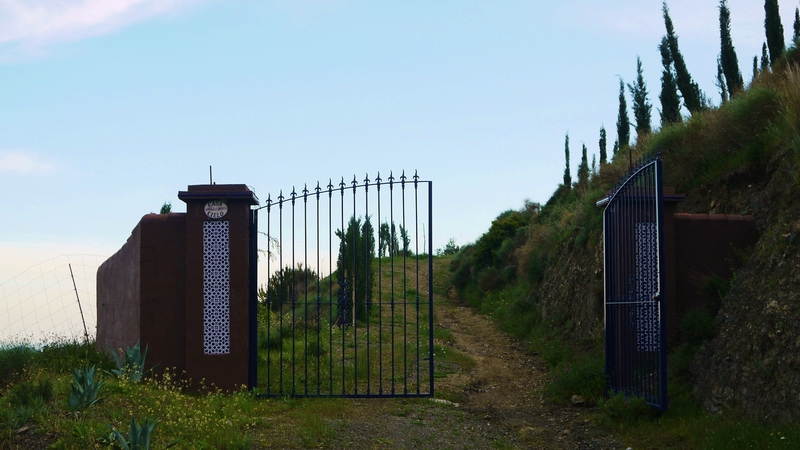 However, the solar system can’t work the submersible pump to get water up 1,500m from the well to the big underground deposito (40,000 litres), or fire up the small electric pump to carry water from the deposito up to the three 3,000 litre depositos on high ground above us. Also, the generator has to be used for high wattage appliances like iron and hair drier. So the black job managed very well just to top up our batteries, but we had to find a more permanent solution. 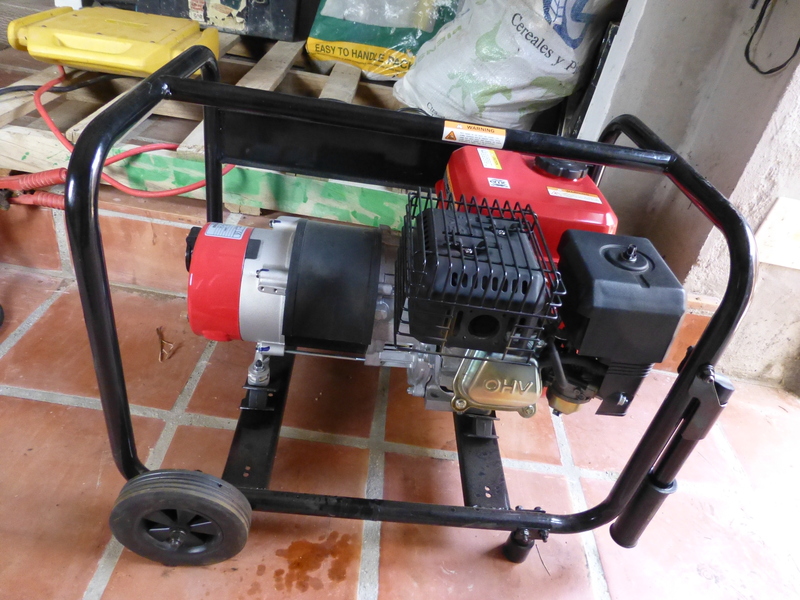 With a new diesel generator costing between £2k-£4k and failing to find a second hand one (BTW the Spanish websites all seem to have a common problem – their search engines don’t search), we eventually decided on something rather revolutionary. Plan B was Joe’s brainchild, that of using a diesel car adapted to provide a quieter power source but this was going to take a little time, especially as we were having to rely on Mark the English mechanic. So just as Joe started working on plan B, the dirty diesel one gave a last black puff and died. Time for plan C; a temporary stop-gap, something to keep us in water and power. Could we use the Robin? Could it pump up the water from the well? The little Robin generator was here when we bought the cabin in April 2006 and soon made redundant. Joe managed to coax it into life and it just about managed to pump up the precious water, provided we had nothing else drawing power (apart from broadband). The Honda could do all of these tasks standing on its head, but we had to make do with what we had. So, this is how we managed until another disaster struck, that of running out of water totally on 21 August, all 49,000 litres used up – exacerbated by summer watering, low water table and also having five months of intermittent generator difficulties. Couldn’t even flush the loo or do the dishes! But we still had drinking water from the nearby spring. Anyway, we had to resort to having 36,000 litres delivered in 6 lorry loads. But the water is another story, so is the saga of Plan B which is still ongoing. Back to the generators, our life blood. The Robin rattled and shook around, but it managed to do most tasks, but one at a time. 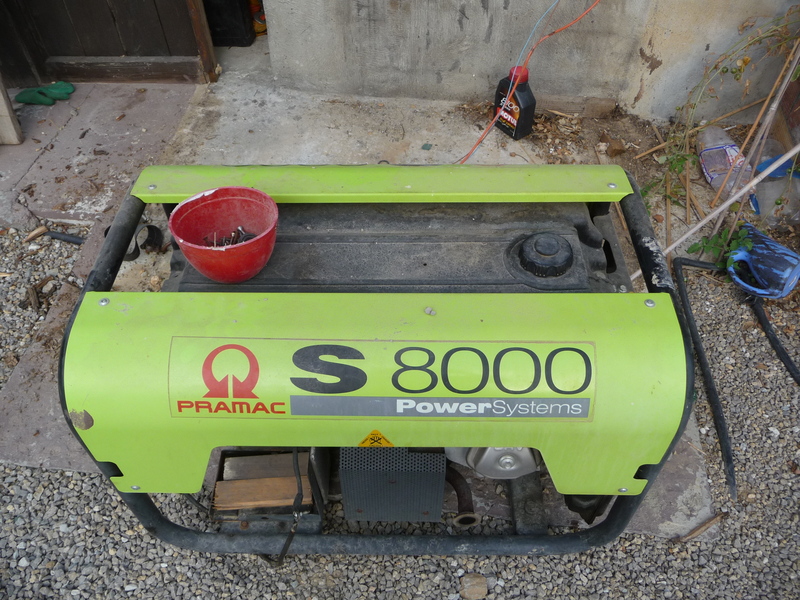 Its days were obviously numbered so we decided to bite the bullet and get ourselves a new, smaller generator that would serve as our emergency supply until we got everything else working as it should. We gave up trying online and drove to a store we’d heard about, ending up buying this lovely little thing. It’s shiny and red and cheap and has kept us going for the last three weeks. Why? Because we haven’t been able to use our solar panels and batteries. Why? because the inverter died and two batteries exploded. More of this later..
As of this moment, in order to have any electricity whatsoever, come rain or shine, we run both gennies alternately throughout the day. Fill one up, start the other until the fuel runs out, etc etc. From 8.00 in the morning, until about 10.30 at night either one or the other runs. Then just torchlight, no more internet, Netflix or catch-up TV, fridge freezer until the next morning. Our fault, we did buy a house without mains electricity, water and sewage. Nobody said it would be easy, being frontier folk!